You don't want to run into Brookfield Central Elianne del Campo on the tennis court. That's because the diminutive sophomore is the total package. del Campo was born in Madrid, Spain and grew up in Mexico before moving to Brookfield 5 years ago. Despite her 5-foot, 2 inch frame, she was a handful for her opponents her freshman year. del Campo finished with a 25-5 record and made it to state as a special qualifier. She split two matches - beating senior Marissa Marks of Germantown (20-6), 6-2, 6-3 and losing to 10th seeded senior Catherine Lindsay (23-8) of Eau Claire Memorial, 6-1, 6-0. Having finished second at sectional, del Campo was not aware of the special qualifying rule. "I thought you had to win sectionals to go to state," she said. "I was bummed out. I was training all season and I didn't make state. When I realized I made special qualifier I was really surprised and excited." Making it as a special qualifier is not a slam dunk and sometimes there are politics involved as coaches on the committee push for their own players. "You never know about special qualifier," veteran Coach Dave Steinbach said. "Our hope was that she'll make it as the No. 2 player from our sectional but she didn't win the finals. The committee pours over the season record with a fine tooth comb. You just hope she has enough wins during the season to be a special qualifier, which she did." del Campo enjoyed her first state experience. "They're were so many people there," she recalled. "I didn't expect so many people there watching your game. There were so many courts. It was so professional. I was impressed. It was a great experience. I had a lot of fun. I knew a lot of coaches I had seen before and they were rooting for me. It was really nice." Coming in as a freshman, Elianne (pronounced el-e-n) knew the Greater Metro was a tough conference. "My teammates had said we had the toughest conference in the whole state," she recalled. "I was getting really nervous, plus I knew some of the people I was going to play against, so I was aware of it." del Campo earned All-Conference honorable mention after finishing third in the tournament. 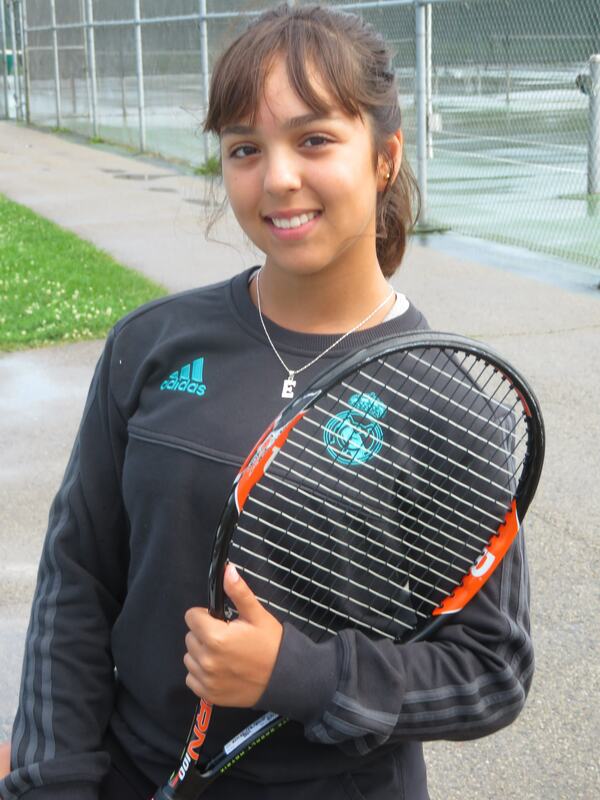 She lost to Brookfield East's Emily Horneffer, 7-5, 6-2, and beat Sussex Hamilton's Melina Mertos, 6-0, 6-2. "Coach says 'I'm little, but I'm mighty,' even though I'm kind of small, I really go for it all on the tennis court," Elianne said of her style. Photo-By Tom "Sky" Skibosh --- Brookfield Central's Elianne del Campo qualified for state last year as a freshman. 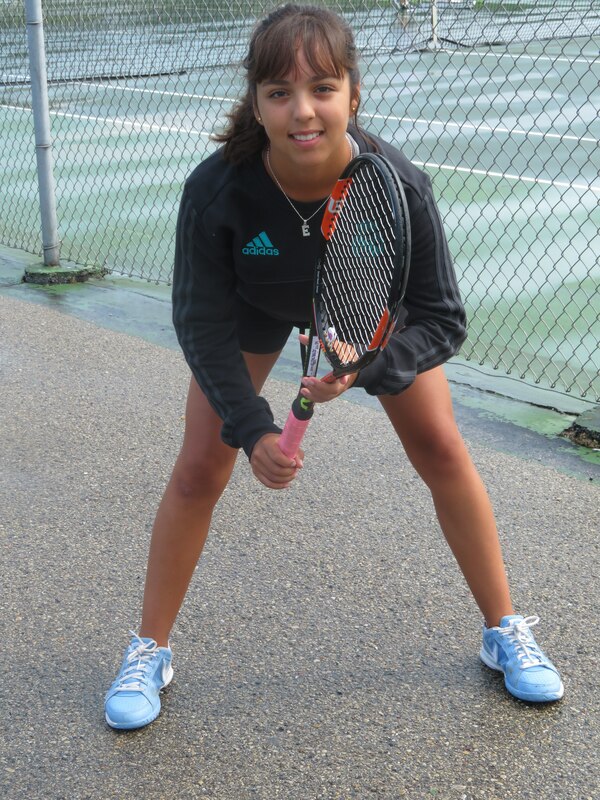 She started playing tennis at 5 years old as her father took her to their club in Spain. "I've be playing ever since," she said. "I was little and playing in little tournaments all the time as well as with my parents (Alfonso, Elianne) and my tennis coach." After moving to Mexico and then to Wisconsin, Elianne went to Brookfield Elementary and Wisconsin Hills, while playing at Elite Sports Club. del Campo talked about her love of the game. "When you hit a shot and it goes in, it's the most comforting feeling ever," she said. "You are moving all the time. When you are concentrating on your own and you have all the pressure in the world (on you), when you do something right, you know you did it all my yourself. It's comforting to know you are doing well." Steinbach first saw Elianne as a 7th or 8th grader. "I scout all of the local programs," he said. "When I see players who are talented, I ask who they are and where are going to school. I was pleased to find out who she was and where she was going." When asked when he thought she was something special he smiled and said "When I saw her." So did her success as a freshman surprise him? "No, not at all," he said. "Because I knew she was good. She is very positive, has good fundamentals and she's a competitor." del Campo talked about her strengths and what she needs to work on. "Aggressiveness. I'm really aggressive," she said. "I'm aggressive mentally and physically. "But I need to get more mental toughness; to not get too nervous before a match. Mental toughness is really the No. 1 thing I want to work on. Coach gives some good advice on how to work on it. With the more matches I play I would feel more confident and get less nervous along the way. It's a time thing." Playing No. 2 singles and sometimes No. 1, despite being a freshman, didn't really put any pressure on Elianne. "I didn't feel that much pressure," she said. "I was just going to do my best whether if I was No. 1, No. 2, No. 3. I was just going to play my best - there was no pressure." del Campo is hoping to build off such a great freshman year. "I feel that I'm a little more confident this year," she said. "I made it last year (to state) and I'm hoping to get back this year. There's a little pressure of making it again. I feel confident knowing about I'm going to go against. Who is going to be my toughest competition. I'm going to give it my best like last year and a little bit more." Steinbach feels del Campo should be more confident, but she still has to be careful of setting the bar too high. Photo-By Tom "Sky" Skibosh --- Brookfield Central's Elianne del Campo proves good things come in small packages. "I would hope it would help her confidence," the veteran coach said. "Sometimes it helps their confidence and sometimes they set their goal so high they get a little tight because maybe they can't reach them. You have to make sure their goals and expectations are fairly close." Steinbach then talked about what del Campo needs to work on and her strong points. "I think all athletes need to work on their all-around game," he said. "She has room for improvement in every aspect. She takes the opportunity and the point if the set-up is there. She'll try to hit a shot to land the point. Instead of just waiting for the opponent to make a mistake." Despite being only a sophomore, Elianne talked about her view on leadership. "I really try to be a leader as much as I can," she said. "I try to help my teammates. Even though I'm not the oldest, I try to act old. Have more leadership with the team and try to help them. "I am always there for my team. Every time they need something I always try help them find the way to be the best they can be. But everyone on the team is a leader, some more so than others. Everyone is really good with helping each other. Everyone is comfortable with each other." Steinbach sees good things from del Campo. "That's a good answer because we do have some strong senior leadership," he said. "She's in the wings, waiting for her turn I think. She's glad to help out whenever I have her demonstrate the skills. I give all my kids the opportunity to display their leadership. "They choose their captains at the end of the season rather than naming a captain at the beginning of the year. This way the whole team can chip in and show their leadership skills and hopefully it helps the whole team camaraderie." "We've had players come in and be No. 1 as a freshman. Sasha Semina was one" http://preps2pros.net/2016/10/06/sasha-semina-a-young-lady-with-many-talents/). "It's wonderful when it happens. We've been blessed with talented players here. When they're exceptionally talented, they can make the top of the lineup. They have to be exceptional because our program is pretty strong." And Elianne del Campo fits the bill. FAVORITE MOVIE: 'Age of Adeline' Scary Movies.